There were 696 press releases posted in the last 24 hours and 153,520 in the last 365 days. HONG KONG, March 21, 2019 (GLOBE NEWSWIRE) -- The 23rd Hong Kong International Film & TV Market (FILMART 2019) was held at the Hong Kong Convention and Exhibition Center (HKCEC) from 18-21, March, 2019. It is an occasion for film, TV and cross-media in Asia, as well as the largest film and TV exhibition in Asia. Huanyu Entertainment, producer of Story of Yanxi Palace, brought two of the latest TV drama projects, Winter Begonia and Court Lady, to appear and attracted the attention of the media and the audience. Winter Begonia starring Huang Xiaoming and Yin Zheng is now shooting in process, demonstrating comprehensively the enchantment of Beijing Opera through the friendship between the businessman Cheng Fengtai (Huang Xiaoming) and the master of Beijing Opera, Shang Xirui (Yin Zheng). It is believed to be a chance for young generation to develop understanding of Beijing Opera. On the other hand, Yu Zheng, the gold medal producer, would be the chief producer and artistic director of Court Lady, which is positioned as a light witty comedy. Various angles of life would be showed through the love story between Cheng Chumo (Xu Kai) and Fu Rou (Li Yitong), including the folk, merchants, officialdom, palaces, and battlefields. In the creation of the script, scholars specializing in the study of Tang history were invited as a guide, who covered the research on traditional garments and the folk custom, in order to present real social style of the Tang Dynasty. It is reported that the main creation team of these two works has no major changes. The creation teams of Story of Yanxi Palace and Legend of Haolan will continue to be used to ensure the stability and unity of quality of the works. In recent years, as the recognition of Chinese film and TV creation has been increasing in the international market, more and more overseas film and TV companies have turned their attention to the Chinese market. Last year, Huanyu Entertainment signed a cooperation agreement on the overseas copyright with FOX Networks Group Asia for drama Legend of Haolan, which achieved mutual benefit and win-win results, and further enhanced the international influence of Huanyu. As the leading force in the field of Chinese film and TV entertainment, Huanyu Entertainment insists on conveying the outstanding traditional Chinese culture through the expressions of works, and has created many brilliant works that are popular overseas. In FILMART 2019, the cooperation between Huanyu and TVB for Court Lady is another effort of Huanyu to move towards overseas, which has naturally attracted the attention of major media. The works of Huanyu Entertainment have been always known for the exquisite costume themes. In recent years, Huanyu has gradually formed the spiritual core of the TV production: conveying the outstanding traditional Chinese culture through the expressions of works. This pursuit has been fully reflected in Story of Yanxi Palace, the burst drama in 2018. The intangible cultural heritage such as embroidery, velvet flowers, Kun Opera in the drama made an impression on audience. Yang Le, CEO of Huanyu Entertainment, said in a conversation with reporters at the exhibition that it was because of the wonderful demonstration of traditional Chinese culture that Story of Yanxi Palace became popular at home and abroad. It is reported that Story of Yanxi Palace was broadcast in more than 90 countries and regions. After being broadcast on TVB Jade in Hong Kong, it has won good reputation from the audience, as well as a highest rating exceeding 38.8. In 2018, it became the first Chinese drama topping Google's annual TV Shows Trends. Yu Zheng, the chief producer of Story of Yanxi Palace, said that there would be more national cultural elements embodied in subsequent works. The works brought to FILMART 2019 have consistently reflected traditional Chinese cultural factors. It is based on the deep understanding and display of traditional Chinese culture that makes the works of Huanyu Entertainment attached more attention worldwide. In 2019, Huanyu Entertainment accelerated the strategic pace of globalization. Speaking of the future global direction of Huanyu, Yang Le believed that global market strategy became practical after Story of Yanxi Palace. Compared with many domestic film and TV companies, there are three core competitiveness of Huanyu: excellent production, positive values and Chinese-style stories. Although the domestic entertainment industry is relatively sluggish, Huanyu still won compliments at home and abroad because of the ingenuity and devotion of production. It is reported that in the current global layout, Huanyu Entertainment has reached cooperation intentions with many major countries and regions in the world, covering Hong Kong, Macao, Taiwan, Brunei, Malaysia, Singapore, Japan, South Korea, the United States, Thailand, Vietnam, etc. Founded in 2012, Huanyu Entertainment is a young production company integrating script writing, investment, production and publication at home and abroad of films and TV series as well as management and publicity of its artists. The future globalization strategy of Huanyu will be not only broadcast on the series, but also cover various forms such as artist output and co-production. In FILMART 2019, according to its own style of works, Huanyu Entertainment designed the exhibition area with the style of the Tang Dynasty, attracting many audiences to appreciate. Besides, a strong team covering distribution, propaganda, branding and artists was sent to the event to communicate with the industry elites and audience. 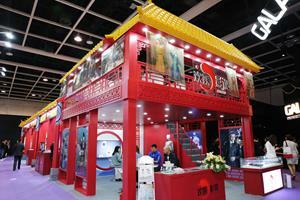 It is said that the Hong Kong Office of Huanyu Entertainment would soon be operational.